Somatic SNAFU—Can a Few Mutant Microglia Cause Neurodegenerative Disease? A paper in the September 1 Nature claims a cadre of rogue microglia are all it takes to orchestrate neurodegeneration. Researchers led by Frederic Geissmann and Omar Abdel-Wahab of Memorial Sloan Kettering Cancer Center in New York, and Marco Prinz of the University of Freiburg in Germany, induced a somatic mutation in about 10 percent of microglia that switched on ERK kinase signaling. The mice later developed a severe neurodegenerative disease that paralyzed them. The researchers determined that damaging inflammation caused by the mutated microglia was likely to blame. The findings raise the possibility that similar somatic mutations in people are responsible for a rare neurodegenerative disease that occurs in children. Most famous for their role in causing cancer, somatic mutations can spontaneously arise in any cell, sometimes giving it a proliferative edge. Mutations in the RAS-MEK-ERK signaling pathway, for example, can cause diseases called histiocytoses if they arise in the myeloid cell lineage, which gives rise to blood and immune cells, including macrophages and microglia. Histiocytoses manifest in different ways, including leukemias, other tumors, and malfunctions in multiple organs. Mysteriously, a small fraction of carriers also get a neurodegenerative disease that manifests between childhood and middle age, with symptoms such as cerebellar ataxia and tremor (Lachenal et al., 2006; Wnorowski et al., 2008). The reason for the neurodegeneration has been a mystery. Geissmann and colleagues speculated it could be caused by microglia descended from erythro-myeloid progenitor cells (EMPs) harboring the same RAS-MEK-ERK somatic mutations. EMPs arise in the embryonic yolk sac early in development, and give rise to microglia in the brain and macrophages in other tissues (Perdiguero et al., 2014; Feb 2015 conference news). In contrast, circulating monocytes are continually replenished by hemotopoietic stem cells (HSCs) in the bone marrow. To find out if somatic mutations in EMPs could beget microglia that trigger neurodegeneration, first author Elvira Mass and colleagues induced a somatic mutation that causes histiocytoses into mice. They chose the V600E variant of the BRAF gene, a substitution that switches on ERK signaling. The researchers generated transgenic mice carrying an inducible copy of the mutated BRAF gene, which could only be switched on via tamoxifen-induced Cre recombination in EMPs. This also turned on yellow fluorescent protein so the researchers could identify the cells. At embryonic day 8.5, they injected pregnant mice with a teeny dose of the drug to ensure that only a fraction of the embryos’ EMPs would express the mutation. About 10 percent of tissue resident macrophages, including microglia, in the resulting offspring expressed V600E BRAF at one month of age. The mutant microglia took up their positions in the brain, but were different from their normal counterparts from the get-go. Those carrying the V600E BRAF expressed elevated markers of proliferation, ERK signaling, and inflammation. In one-month-old mice, these feisty microglia had yet to cause trouble, but by four months of age, the researchers noticed neurological symptoms in the mice, including loss of hind limb reflexes and shortened stride. At seven months, 90 percent of the animals were affected and by nine months 60 percent of the mice had full hind limb paralysis. These symptoms, similar to cerebellar ataxia, are common in people with cerebral histiocytoses. Feeding the mice a BRAF inhibitor starting at one month of age drastically delayed onset and slowed progression. The researchers next searched for pathological changes that could have triggered the disorder. In month-old mice, the researchers found signs of elevated microglial and astrocyte activation, but not neuronal death. Oddly, by immunohistochemistry using the 22C11 antibody, the researchers noticed deposits of amyloid precursor protein (APP) in the inflamed areas, a phenomenon that Geissmann attributed to release of the membrane protein from newly damaged axons. In six-month-old animals, large clusters of activated, phagocytic microglia carrying the BRAF mutation crowded in the thalamus, brain stem, cerebellum, and spinal cord. These same regions were rife with synaptic and neuronal loss, demyelination, and astrogliosis. The mutant microglia had a small proliferative advantage compared with their wild-type counterparts, but Geissmann attributed the bulk of the neuronal damage to the activation of the cells, rather than their expansion. Treatment with a BRAF inhibitor mitigated these responses. Gene expression analysis of mutant microglia taken from paralyzed mice revealed the differential expression of around 8,000 genes, 80 percent of which were upregulated compared to microglia from control mice. These genes included a bevy of pro-inflammatory mediators, including cytokines, phagocytosis boosters, matrix proteins, and growth factors. For some reason, the thalamus, brain stem, cerebellum, and spinal cord were uniquely vulnerable to the presence of the V600E BRAF mutant cells. Tissue macrophages carrying the mutation also expanded in the liver, spleen, kidney, and lung, even more so than in the brain, but did not cause damage in those regions. Geissmann speculated that differences in the tissue microenvironment could play a role in this selective vulnerability. For example, normal liver macrophages are in a near constant state of activation, Geissmann said, so the organ is equipped to deal with them. Perhaps the posterior part of the brain is unaccustomed to constant microglial activation, he said. Indeed, chronic microglial activation occurs during AD as well, and appears to ultimately inflict damage, rather than helpful responses. Finally, the researchers investigated whether patients with histiocytoses also had abnormal microglia. They analyzed postmortem brain tissue from three patients with Erdheim-Chester disease (ECD), and conducted gene expression analysis on brain biopsies from one person with Langerhans cell histiocytosis (LCH), and another with juvenile xanthogranuloma (JXG). All of these patients had neurodegenerative disease associated with their histiocytoses, which were all caused by BRAF V600E mutations. In the ECD samples, the researchers spotted abundant activated microglia gathered at sites of neuronal loss, astrogliosis, and demyelination. Compared with data from five control samples, gene expression analysis on the JXG and LCH samples revealed an upregulation of genes in the MAPK pathway, including multiple pro-inflammatory cytokines. The findings support the idea that activated microglia wreak havoc in the brain and cause neurodegeneration in people with histiocytoses. For a somatic mutation to have an effect, affected cells must propagate sufficiently. EMPs proliferate during early development, making it a prime time for mutant clones to multiply, Geissmann said. Perhaps the number of mutant clones born during the EMP stage would suffice to harm neurons, he said. However, if microglia are also bestowed with a proliferative edge, this would likely exacerbate the damage, he added. Either way, Geissmann proposed that inhibitors of ERK signaling might thwart neurodegeneration when mutant microglia are involved. In an accompanying editorial, Stefan Tarnawsky and Mervin Yoder at Indiana University in Indianapolis noted opportunities for better diagnosis in this scenario. When somatic mutations occur in EMPs during early development, macrophages in many regions of the body will likely carry the mutations, not just microglia in the brain. “This suggests that it might be possible to collect macrophage samples from more easily acces­sible, non-CNS tissues to look for biomarkers when diagnosing microglia-related disease,” they wrote. The authors very elegantly modeled the etiology and progression of neurodegeneration in patients with histiocytoses in a mouse model with mosaic somatic expression of the BRAF V600E mutation in yolk sac-derived erythro-myeloid progenitors (EMPs). Within the CNS, a key consequence of targeting a subset of EMPs in this way was to give rise to a small population of ERK-activated microglia. Microglial cells that carry the BRAF mutation were conferred survival and proliferative advantages, possibly as a result of the hyperactive RAS-MEK-ERK signaling. What I found interesting was that normal microglia, which presumably inhabited the bulk of the CNS, were unable to promote homeostasis in the long run by out-proliferating the rogue microglial cells just on the basis of being the healthy majority. Evidently, the steady state self-renewal rates of microglia (Askew et al., 2017; Tay et al., 2017) are insufficient to overcome dysfunctional microglia with perturbed cell cycling. This study brought to mind the Nasu-Hakola disease (NHD) that is caused by inherited mutations in either the TREM2 or TYROBP genes, which in the CNS are mainly expressed in microglial cells. A feature of NHD is early onset dementia in patients who typically do not survive beyond 50 years of age. Here, Mass et al. showed that neurodegeneration indicated by gliosis, accumulation of amyloid precursor protein, degradation of myelin, and neuronal death has a late onset. Given the authors found constitutive expression of BRAF V600E in EMPs resulted in embryonic lethality, it is possible that the somatic mutation has a dosage effect. Remarkably, the presence of BRAF V600E microglia in this mouse model appeared to have little impact in early postnatal brain development. Symptoms that presented later in middle-aged adults were mainly neurologic. The BRAF inhibitor was reportedly very effective in delaying the onset of neurological symptoms in the mouse model and in some patients with histiocytic CNS diseases. In the accompanying Nature News & Views, it was suggested that molecular targets restricted to EMPs or microglia could be identified for therapeutic benefits. However an alternative could be to explore the feasibility of host-derived bone marrow transplantation to replace some endogenous healthy and mutant microglia, since the HSC lineages are free of the mutation. Given that the pathologic brain regions were mainly the brain stem and cerebellum, the engraftment of disease-free peripheral BM-derived cells that integrate long-term as macrophages may be more permissible in these compartments. Askew K, Li K, Olmos-Alonso A, Garcia-Moreno F, Liang Y, Richardson P, Tipton T, Chapman MA, Riecken K, Beccari S, Sierra A, Molnár Z, Cragg MS, Garaschuk O, Perry VH, Gomez-Nicola D. Coupled Proliferation and Apoptosis Maintain the Rapid Turnover of Microglia in the Adult Brain. Cell Rep. 2017 Jan 10;18(2):391-405. PubMed. Lachenal F, Cotton F, Desmurs-Clavel H, Haroche J, Taillia H, Magy N, Hamidou M, Salvatierra J, Piette JC, Vital-Durand D, Rousset H. Neurological manifestations and neuroradiological presentation of Erdheim-Chester disease: report of 6 cases and systematic review of the literature. J Neurol. 2006 Oct;253(10):1267-77. Epub 2006 Oct 24 PubMed. Wnorowski M, Prosch H, Prayer D, Janssen G, Gadner H, Grois N. Pattern and course of neurodegeneration in Langerhans cell histiocytosis. J Pediatr. 2008 Jul;153(1):127-32. Epub 2008 Feb 11 PubMed. Mass E, Jacome-Galarza CE, Blank T, Lazarov T, Durham BH, Ozkaya N, Pastore A, Schwabenland M, Chung YR, Rosenblum MK, Prinz M, Abdel-Wahab O, Geissmann F. A somatic mutation in erythro-myeloid progenitors causes neurodegenerative disease. Nature. 2017 Aug 30; PubMed. Tarnawsky SP, Yoder MC. 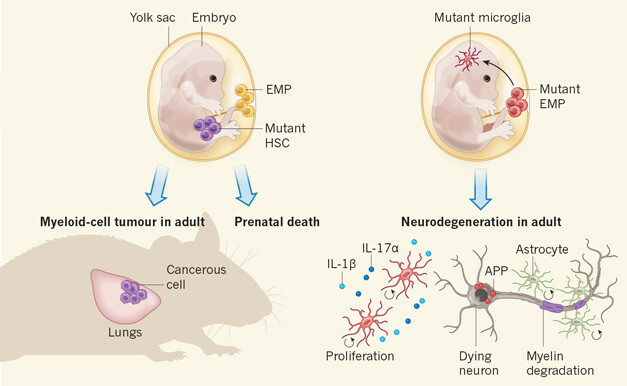 Neuroscience: From embryo mutation to adult degeneration. Nature. 2017 Aug 30; PubMed.